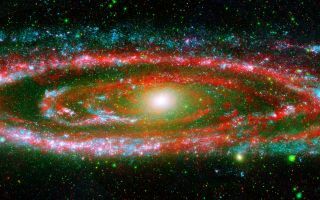 The many "personalities" of our great galactic neighbor, the Andromeda galaxy, are exposed in this new composite image from NASA's Galaxy Evolution Explorer and the Spitzer Space Telescope. The many "personalities" of our great galactic neighbor, the Andromeda galaxy, are exposed in this stunning space wallpaper, which is a composite image from NASA's Galaxy Evolution Explorer and the Spitzer Space Telescope. The wide, ultraviolet eyes of Galaxy Evolution Explorer reveal Andromeda's "fiery" nature -- hotter regions brimming with young and old stars. In contrast, Spitzer's super-sensitive infrared eyes show Andromeda's relatively "cool" side, which includes embryonic stars hidden in their dusty cocoons.